March 25 is the 84th day of the year(85th in leap years) in the Gregorian calendar.There are 281 days remaining until the end of the year. 1811 – Percy Bysshe Shelley is expelled from the University of Oxford for publishing the pamphlet The Necessity of Atheism . 1894 – Coxey's Army, the first significant American protest march, departs Massillon, Ohio for Washington, D.C.
1979 – The first fully functional Space Shuttle orbiter, Columbia , is delivered to the John F. Kennedy Space Center to be prepared for its first launch. Pope Constantine was Pope from 25 March 708 to his death in 715. With the exception of Antipope Constantine, he was the only pope to take such a "quintessentially" Eastern name of an emperor. During this period, the regnal name was also used by emperors and patriarchs. Year 1252 (MCCLII) was a leap year starting on Monday of the Julian calendar. Conrad, called the Younger or the Boy, but usually known by the diminutive Conradin, was the Duke of Swabia, King of Jerusalem, and King of Sicily. Year 1259 (MCCLIX) was a common year starting on Wednesday of the Julian calendar. Li Kening (李克寧) was a younger brother of the late Chinese Tang Dynasty warlord Li Keyong the Prince of Jin. After Li Keyong's death, Li Kening initially served as a key advisor to Li Keyong's son and successor Li Cunxu, but soon was persuaded by his wife Lady Meng to try to take over from Li Cunxu. His plot was discovered, and Li Cunxu put him to death. Saint Marie-Alphonsine Danil Ghattas was a Palestinian Christian nun who founded the Dominican Sisters of the Most Holy Rosary of Jerusalem, the first Palestinian congregation. She was beatified by Archbishop Angelo Amato on behalf of Pope Benedict XVI in 2009. Blessed Оmelyan Kovch was a Ukrainian Greek-Catholic priest murdered in Majdanek concentration camp. San Marino, officially the Republic of San Marino, also known as the Most Serene Republic of San Marino, is an enclaved microstate surrounded by Italy, situated on the Italian Peninsula on the northeastern side of the Apennine Mountains. Its size is just over 61 km2 (24 sq mi), with a population of 33,562. Its capital is the City of San Marino and its largest settlement is Dogana in the municipality of Serravalle. 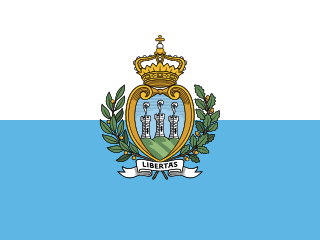 San Marino has the smallest population of all the members of the Council of Europe. With Italian being the official language, along with strong financial and ethno-cultural connections, San Marino maintains close ties to its much larger neighbour; it is located close to the riviera of Rimini, one of Italy's main coastal resort areas. Ælfwold II was a Bishop of Sherborne in Dorset. Barontius (Barontus) and Desiderius were two 8th century hermits who are venerated as saints by the Catholic Church. They were hermits near Pistoia, in Italy. ↑ Corbett, D. A. (1980). The regimental badges of New Zealand, an illustrated history of the badges and insignia worn by the New Zealand Army. Auckland: R. Richards. ISBN 0908596057. OCLC 14030948. ↑ Sarıkaya, Makbule. "Selim Sırrı Tarcan Ve Gürbüz Türk Çocuğu" (in Turkish). Atatürk Araştırma Merkezi. Archived from the original on 21 December 2012. Retrieved 24 October 2012. ↑ "Jenny Slate". United Press International . Retrieved Nov 10, 2018. ↑ Antonio Borrelli, ‘San Nicodemo di Mammola’, Santi, beati e testimoni, 17 June 2002. ↑ "Scott Walker, experimental pop hero, dies aged 76". The Guardian. 2019-03-25. Wikimedia Commons has media related to March 25 .